includes an array of elegant background music, including Light Classical and Baroque music, pretty Pop and Jazz tunes, Broadway show tunes, and more. 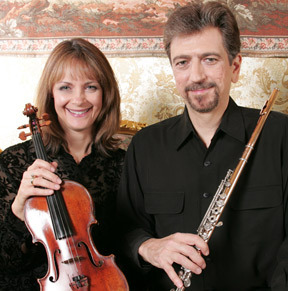 For weddings, The Paragon Duo performs traditional, classical, sacred and popular wedding music. The talent and experience of these superbly trained musicians enable them to seamlessly adapt their music to fit each ceremony individually and perfectly. Whether your event will take place indoors, or in an elegant fair-weather outdoor setting, The Paragon Duo is perfect for wedding ceremonies, dinners, cocktail parties, and receptions. This delightful combination of Flute and Violin has proven to be perfect for gatherings of up to 75 guests.